If someone has stolen and is using your art or other works of creation without your permission, the first step is to contact them and ask them to stop. A cease and desist letter is the best way to do that, but here are a few things you need to know about emailing notices and how it could affect your legal copyrights. Yes, however, if the matter is serious and you really will take further legal action if your cease and desist order is ignored, you probably should not send an email to rely on as proof of sending a request. Emails can be easily faked and doctored, backdated, and altered after the fact making it difficult to prove which version is valid when the two opposing parties present a judge with two different versions both claiming to have the real version. Instead, do invest in the small amount of money it takes to send a letter via certified, return-receipt -- and ask for a signature be obtained from the addressee. This will serve as far more convincing and will carry more weight in a court of law than an email or even a letter sent without a signature requirement. It can be difficult for a judge to decide which email version is for real: yours or the one the defendant says is different (and may have doctored) and this could result in a case being thrown out, damages being minimal, or even penalties or charges may be assessed for tampering with legal documents. It is also difficult to prove that just because you sent an email that the correct person received it. Emails can get lost in a spam folder, a recipient may see a "return receipt requested" and delete it, or if there are multiple users on an email account, claim that it was sent to someone else and you violated their privacy rights. Using more formal channels of communication (certified letter) than an email also sends the message that you are very serious about your demands listed in your cease and desist letter. This alone might be enough to get the (alleged) offender to stop what they are doing. Ultimately, it is usually better when business disputes can be resolved without going to court. Lawyers and court proceedings can be expensive, and your case could take months or even years to be heard. If someone has grievously caused you harm in some substantial way, you may have what is called a 'tort." If so, it is worth talking to a lawyer because you may be entitled to more compensation when a tort can easily be proven to have occurred. Email is not necessarily always the wrong approach. 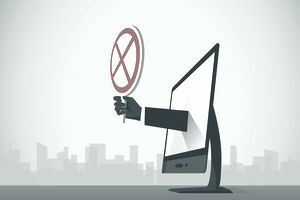 For all the pesky little infringers out there who have a picture of yours on a blog or website, an email is probably fine because you are not likely to ever take action against certain people. But if you do think you may want to protect your legal rights talk to a lawyer who specializes in intellectual property rights first, or send a certified letter—and get a signature!